God instructed the early Christian church leaders to create a multi-ethnic church family. After his rooftop dream, Peter learned that, “that God is no respecter of persons; but in every nation he who fears Him and works righteousness is accepted with Him (Acts 10:34, 35). Jesus was not joking when He said, “Go and teach all nations, baptizing them in the name of the Father and of the Son and of the Holy Spirit, teaching them to observe all things, whatever I commanded you. And, behold, I am with you all the days until the end of the world” (Matthew 28:19, 20). Even with the Word of God teaching us to NOT BE RESPECTORS OF PERSONS (Ethnicity), we, the Adventist Church, are still segregated in the 21st Century. This is a major blemish on God’s end time Church. The time has come for us to prayerfully seek ways to desegregate and achieve a certain level of ethnic unity if we are ever going to be ready for Jesus’ second coming in this generation. As of now, we have what is known as “white conferences” and “black conferences.” In part, this is true. Even though both conferences have a number of ethnic churches within their constituency (Hispanic, Asian, etc. ), the conference administration is primarily white and black. Most “white conferences” have Caucasian presidents and other administrators and most “black conferences” have black presidents and other administrators. The segregated condition we are currently in causes problems at many levels. For example: In the state of Pennsylvania there is a “white conference” office and a “black conference” office within fifteen miles of each other. The administration and constituencies for both conferences do not work together to impact God’s harvest. There have been many attempts to create a working relationship, but they usually fail. Not only that, both conferences have boarding academies within 37 miles of each other and two separate campmeetings (37 miles a part). 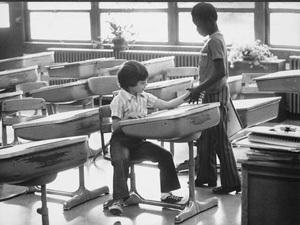 It is a shame that our schools have to suffer so much when we could be desegregating and uniting together in brotherly love (Philadelphia = Brotherly Love). This would not be the case for every conference across North America. I would only reorganize the administration in state conferences where there are a large number of constituencies who are not represented at the conference level. For example: In all three conferences in the state of California, I would make sure the top three honchos (president, vice president, and treasurer) were a mix of white, black, Hispanic, and/or Asian. To make sure there was a smooth transition, I would also develop an “African-American Ministry” in the state conferences where there is a large black population (Southern California, some mid-West states, most East Coast states, Southern states, etc.). The time has come for God’s end time Church to desegregate and be unified in Philadelphia love (brotherly love). Please contact me if you have ideas on how to ask our Church leaders to prayerfully consider and act upon this issue. Thank you and God bless! ← Do Church Membership Numbers Matter? This is a very sensitive subject, and that’s not putting it mildly. Something does need to change here, but it must come from both administration and laity. Until we see the need, a change will not occur. Thank you for challenging the church to consider this issue.